Three female co-workers (Jane Fonda, Lili Tomlin, and Dolly Parton) seek revenge on their sexist male boss (Dabney Coleman). This groundbreaking comedy about sexual discrimination in the workplace has held up surprisingly well, thanks in no small part to the lead performances: Parton (in her acting debut) sparkles, Tomlin has rarely been funnier, and Dabney Coleman’s turn as a sexist pig is priceless. While the script is unnecessarily clumsy (the entire slapstick hospital sequence seems gratuitous, for instance), there are enough genuinely humorous moments to hold interest. 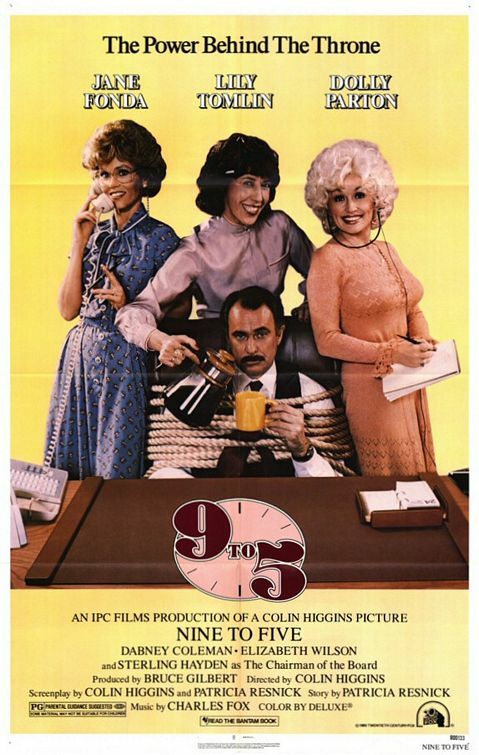 Ultimately, while the focus on Nine to Five may be specifically female, the desire to seek revenge against one’s boss remains universal — one can’t help feeling vicarious satisfaction upon seeing Coleman held hostage for weeks on end while the three women turn things around in the office. Who knew that a film about sexual harassment and gender politics could be such a feel-good experience? Yes. Though uneven, this classic workplace comedy remains must-see viewing. It would make a great double-bill with the modern cult hit Office Space (1999). An important film of its time, however. Director Colin Higgins coaxed vibrant performances from just about everybody here, and there are many recognizable ‘types’ on display. The leads are fine and work comfortably well as a trio. Coleman is a great a-hole. I do have a special fondness for some of the talented character actresses on the periphery: Elizabeth Wilson as the efficiency spy, Marian Mercer as Coleman’s clueless wife, and Peggy Pope as the office alkie. Sterling Hayden’s sudden appearance in the last ten minutes is a delight. And, dang, Parton’s title song will probably always remain catchy!